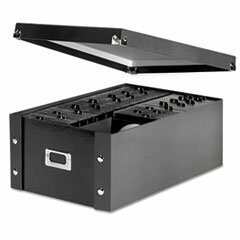 * Organize your CDs with this desktop storage box that holds full or slim jewel cases. Sturdy industrial snaps make it quick to assemble and keep it together securely. Use the card holder to label the contents. Leather-like PVC laminate exterior and silver accents give the storage box an attractive, stylish appearance. Media Stored: CDs; Media Quantity Held: 120 Slim/60 Std. Cases. View More In CD Racks. Sliding Rack Server vented Shelf 1U 19" 4 Post Rack Mount-Adjustable 24"-32"